The Artisan's Market is an opportunity for artists who produce work that is not plein air in the traditional sense to create, display and sell their work as part of Plein Air Easton. The event of the summer! Join us in celebrating in the true spirit of plein air painting. Join us as we take to the streets of downtown Easton for a fun and relaxed nocturne paint out. Join Trippe Gallery for this free demo featuring PAE Competition Artists and more! FREE AND OPEN TO THE PUBLIC. View and purchase paintings created by the 58 competition artists. Local artisans showcasing their varied art forms. Wood sculptures, metals, furniture, jewelry, mosaics and photography are some of the distinctive art that will be displayed and sold. Registration Required, $10 per person. All ages. Watch as nearly 200 artists complete a painting in 2 hours in downtown Easton. FREE AND OPEN TO THE PUBLIC. This is the first and only chance to see 58 brand new 6x8 paintings unveiled that have been created by the competition artists. 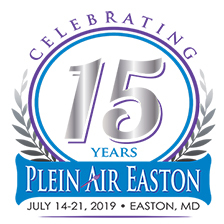 Join our 2019 competition judge, Dr. David C. Levy as he discusses his winning selections for Plein Air Easton 2019.